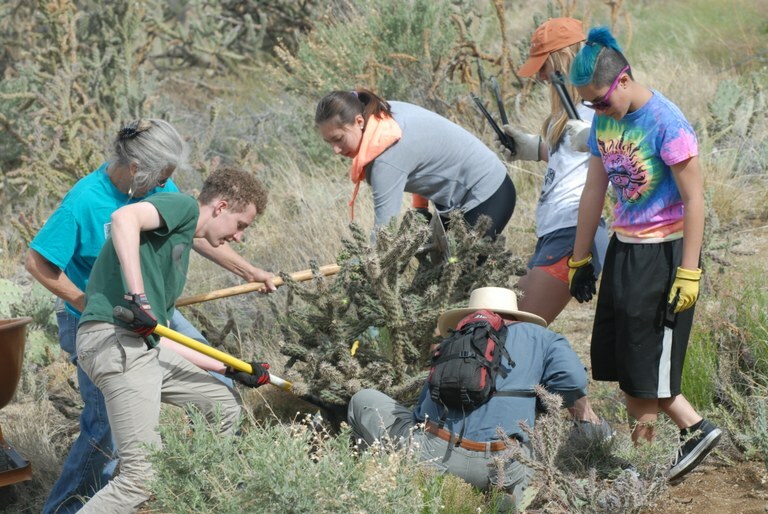 Teens help clean up at Piedra Lisa Trailhead. Volunteer to protect our beautiful resources by joining our Annual Spring Clean Up series. Our beautiful parks, open spaces and trails are the common thread that pulls all of Albuquerque together. The City of Albuquerque manages more than 170 miles of trails that link our valleys, bosque, urban areas, and foothill vistas. You can volunteer to help care for and protect these resources by being a part of our Annual Spring Cleanup series. The Parks and Recreation Department’s Open Space Division will kick off the five-event series on Saturday, March 31 with the Route 66 Clean Up from 8:30 a.m. to 12:30 p.m. at the Route 66 Open Space, on old Route 66 just past Tramway NE. Get there at 8:30 a.m. to register and enjoy donated morning snacks! Bring gloves, sun protection, and plenty of water. Parking is sometimes limited, so carpool if you can. To make arrangements for groups of five or more, please contact Jim Sattler at (505) 452-5213 or [email protected].